All-on-4 dental implants are another restoration option for missing teeth. If you regularly wear dentures or are missing most/all of your natural teeth, all-on-4 may be the optimal treatment plan for you. The treatment name, All-on-4, is descriptive. The dentist builds an entire upper or lower arch of teeth on just 4 dental implants. This technology can be used on both the upper and lower jaw, and like regular dental implants, they look and function just like natural teeth. To place All-on-4, four original titanium implants are placed into either the upper or lower jaw. These four implants hold the entire bridge into place (hint the name). Your dentist will create a fixed set of teeth, which are placed onto the implants. These teeth can be customized to look exactly like your real teeth, contributing to the natural look and feel of All-on-4. Not only can All-on-4 restore the look of your smile and the use of your teeth, but they are also helpful for stopping bone loss. When you are missing teeth, the jawbone beneath them can begin to wear away. These implants can stop bone deterioration and fix the “sunken” facial look that many individuals experience when they are missing teeth. 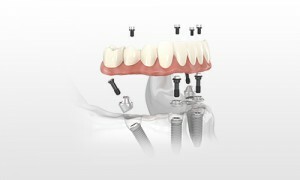 All-on-4 differs from regular dental implant options. They offer the same durability and strength of regular implants but do not require bone grafting. In fact, they are the preferred surgery method for patients with low jaw bone density. The surgery for All-on-4 is quicker than for regular implants, and the bridge of new teeth are added the same day. The overall recovery time is much quicker, as well, because All-on-4 do not require multiple surgeries for placement as traditional implants do. As a general rule of thumb, All-on-4 is generally a cheaper alternative to regular dental implants. After your All-on-4 dental surgery, it is important to maintain regular check-ups with your dentist to ensure that everything is running smoothly.